Here is the link to the workshops at the Labor Notes conference. 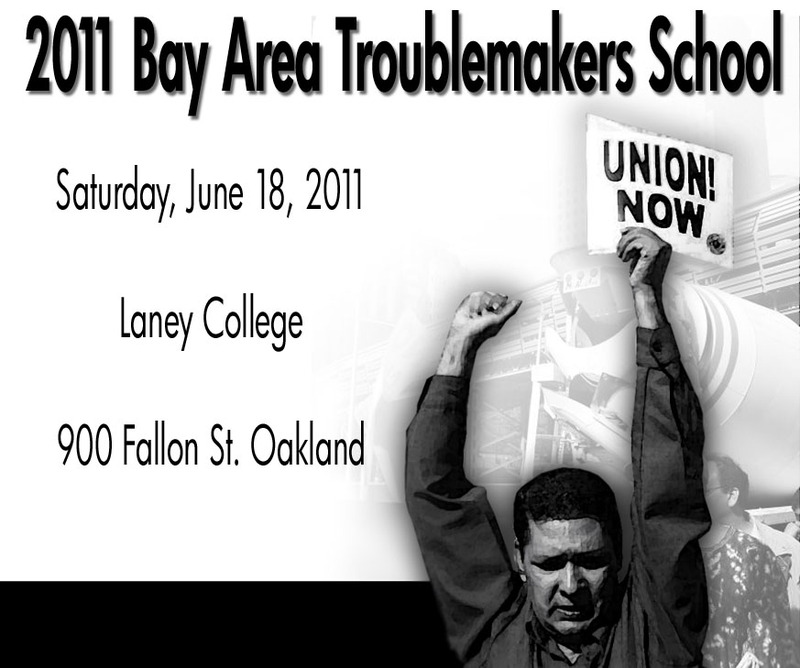 The Labor Notes Bay Area Troublemakers School is next Saturday at Laney College 8:30 am to 6pm. It’s an all volunteer operation and we ask that you register in advance so registration, food, rooms and all those things can be organized better. But if the decision is last minute, just show up and we will do the best we can. The registration just covers basic costs to allow everybody to attend. Tabling: Organizations are welcome to table. There is plenty of space but we only have tables to provide for the first 10 organizations requesting tables. There is no charge but people who are tabling are expected to register for the conference. Call 510-542-9436. Outreach: If you know others who might be interested in this school and networking opportunity please forward this email. The “spirit of Wisconsin” – working people standing up for their unions, their rights and their fair share of society’s benefits – is coming to the Bay Area on Saturday, June 18th at the 3rdBay Area Troublemakers School at Laney College. This School, sponsored by Labor Notes, brings together a collection of vibrant, engaged, curious and activist members of unions, worker centers, and community-based pro-labor organizations to share struggles, learn together about economic forces shaping our world, and kindle inspiration and solidarity. At the 2009 School, 300 people attended from dozens of unions and worker organizations; this School is expected to be even larger and more diverse. For more information on workshops, schedules, and registration for the Troublemakers School, please go to schools. 9:00am – 10:30am Opening Session Monadel Herzallah, President of Arab American Union Members Council, on the uprisings in Egypt. Pilar Schiavo of National Nurses United on the uprising in Wisconsin. Pedro Kapila De Sa, ILWU Local 6 Member, will be giving a response. 12:30pm – 2:00pm Lunch and Caucuses Participants will be able to create their own additional caucuses. 4:00pm – 6:00pm Closing Session The closing session will feature reflections on local Bay Area struggles by rank and file workers and community members who were active in those struggles. Mark Brenner, Director of Labor Notes will give a response and close the day. For 30 years Labor Notes has been a home base for activists who want to put the movement back in the labor movement. We connect thousands of troublemakers around the country who share your vision of a labor movement worth fighting for. But we can’t do it without your support, especially in these hard times. Please donate today! As long as the preeminent position of US imperialism brought home super-profits after WWII, infrastructure, education, technology and industry (particularly the military-industrial complex) created a high demand for labor. Rising wages increasingly came with labor peace, enabling the labor bureaucracy to transform itself into a self- perpetuating dues collection agency that acted in its own interests, abandoning class conflict for the “rational” road of arbitration, lawsuits, legislation, and buying politicians.This worked well for about 25 years, but the laws of capitalist economics precluded the fantasies of the labor bureaucracy from enduring. This strategy is not just a mistake. Rather, the union tops are doing their job, as defined for them by the bosses’ legal system. They will do everything possible to keep workers from taking strike action, and from mounting solidarity actions with workers with workers in other unions, counties, districts, states or nations. The labor bosses see the upsurge in rank-and-file militancy as a threat, which they can only contain by corralling it into electoral politics. Thus, the popular sentiment for a general strike in Wisconsin was diffused into a recall campaign, which prevents immediate militant action, and steers workers into placing faith and hope in the Democrats rather than in our own self-organized mass actions. Thus, the AFL-CIO forbids any mention of opposition to foreign wars as they prepare to rally the troops for the 2012 electoral cycle. Effective strike action and general strikes cannot be organized unless we first either take over our unions, or else build new unions and other workers’ organizations with a new leadership. Our current union misleaders’ attitude is that they are only responsible to act in the interest of the dues-paying membership – not the future members, not the unorganized workers, not the unemployed, and certainly not the workers of the world, oppressed, exploited and brutalized as we are by Wall Street and the military industrial war machine. But our class can only survive and win if we take up the old Knights of Labor slogan: An Injury to One Is the Concern of All! Solidarity is our only power, and the ability to strike in the historic interest of the class is our strongest weapon. When the leaders of today’s unions spurn these tools of the international working class, they act as the agents of the ruling class in our organizations, and must be driven out and replaced. That means we need rank-and-file class struggle caucuses to promote a new militant leadership, to fight for working class independence, and to build a fighting workers/labor party that unites the entire working class and all our allies nationally and internationally to strike as one against the rule of the exploiters and build a movement for workers’ power and workers’ownership of the means of production.